Tamir Rice had his hands in his pockets when he was shot and wasn't reaching for the pellet gun he was carrying, according to an expert hired by the boy's family to review a frame-by-frame video of the deadly encounter. 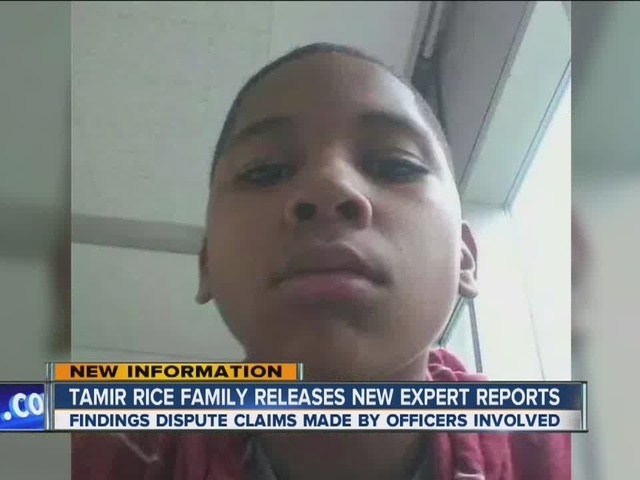 The law firm representing the family of Tamir Rice sent a letter to Cuyahoga County Prosecutor Timothy McGinty Friday, saying expert reports don't line up with the statements the officers who shot and killed Tamir made in front of the grand jury. Earlier this week, prosecutors released the statements officers Timothy Loehmann and Frank Garmback made to the grand jury regarding the November 2014 shooting in which Tamir was shot after authorities received a report of a man pointing and waving a gun outside Cudell Recreation Center. Both officers wrote that Tamir reached for his waistband and that they yelled at him to show his hands before Loehmann shot him twice. The Chandra Law Firm LLC released three expert reports Friday that dispute the officers' claims. Two of the reports were written by experts who have previously called the shooting "unreasonable" and "unjustified" --Jeffrey Noble, former deputy chief of police in Irvine, Calif., and Roger Clark, a police procedures consultant and veteran of the Los Angeles Sheriff's Department. Read the Noble's report on the officers' statements here. Read Clark's new report here. The third report is by Jesse Wobrock, a biomedical engineer who performed a forensic biomechanical engineering and kinematic analysis on the shooting. Wobrock concluded, according to his report, that Loehmann shot Tamir within 1 second of opening the car door--not 1.7 seconds like previously reported--and that since the windows of the car were up, Tamir wouldn't have heard the officers' verbal commands to show them his hands. The Chandra Law Firm LLC told McGinty in the letter Friday that it is "critically important" that the grand jury hear Wobrock's testimony.